Julianna, who is a third-year trumpet player with the Vanguard Cadets (and a freshman at the University of California -- Santa Cruz), sent this one in. 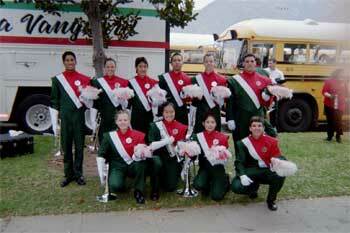 "This is a picture of a group of my best friends that I march with in the Vanguard Cadets. It was taken after we had finished marching the Tournamen of Roses parade in Pasadena, Calif., on January 1. That was one of the best experiences I've ever had marching, especially with my best friends surrounding me: From left to right, top: Tariq, me, Matt, Pablo, Will and Jacob; bottom: Nicole, Esther, Traci and Josh." Thanks Julianna!